In 1973, the American economy was entering a recession and auteurs were running gloriously amok in Hollywood. Each element courses through “Charley Varrick.” The eponymous character (Walter Matthau) is an air circus pilot turned crop duster, and while his piloting abilities conveniently factor into the plot, allowing for sneaky getaways and a unique variant on the cinematic car chase, his crop-dusting business also carves out space for a little symbolic heft. 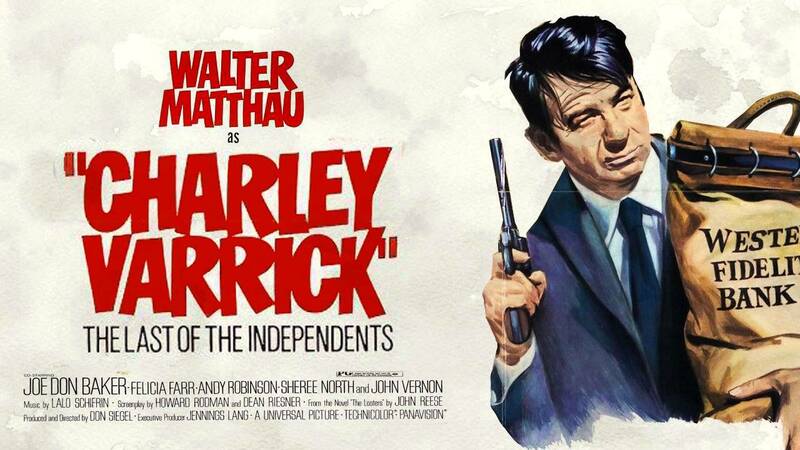 His business slogan is “The Last of the Independents”, which was director Don Siegel’s working title for the movie, and is how Varrick views himself, lamenting a society being ground up by what he deems The Combine, big business freely intermingling with more evil forces, squeezing out run-of-the-mill folks like himself, which is why he has turn to bank robberies to supplement his income. Not that he is a post-Nixon Robin Hood. 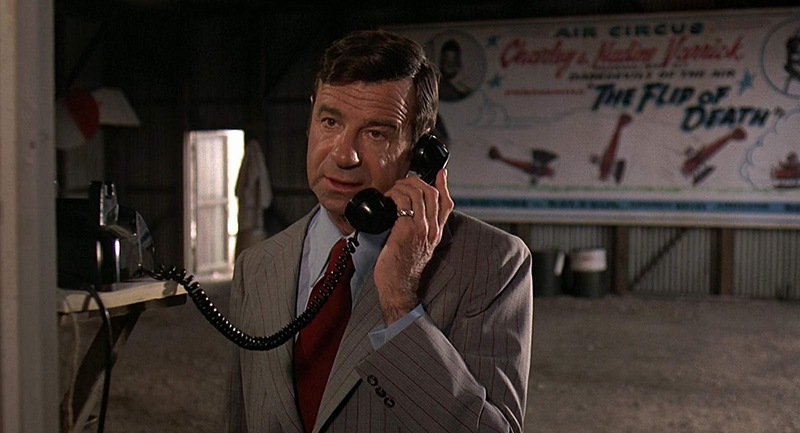 “Charley Varrick” is a violent, occasionally sadistic, often sexist, frequently heartless film. 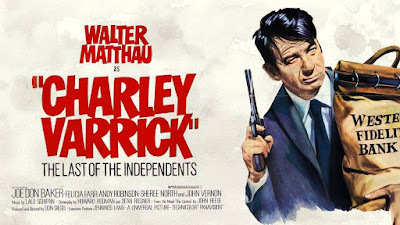 It opens with a montage of Americana, kids at play and adults strolling down the street, which, given the film to come, is not ironic counterpoint but Norman Rockwell existing side-by-side with Charley Varrick. “Charley Varrick” opens with a carefully planned bank robbery that goes wrong when one of Charley’s accomplices winds up dead along with a couple cops. These deaths both are and are not collateral damage. The policemen, shot by Nadine (Jacqueline Scott), Charley’s wife and his small gang’s getaway driver, are just sort of written off, and because we are then asked to sympathize with the spouse of the women who killed them, Siegel is placing us squarely in the moral muck and mire. He ups those murky stakes in the immediate aftermath of the getaway when Nadine, wounded, passes out. Rather than taking her with them, hoping she hangs on, getting her medical assistance, Charley kisses her goodbye and then leaves her, still alive, in the car which he rigs to explode, evocative of the film’s overriding grim moral calculus, the necessity of what it takes to survive in a world gone cold. That calculus becomes clearer as the robbery goes even more wrong after the fact, most of the money proving to be dirty, laundered through the small town New Mexican bank at the behest of the mob who tasks the casually cruel Molly (Joe Don Baker) with getting it back. Molly might be a typical heavy, but the implicated bank manager, Harold Young (Woodrow Parfrey), is not typical at all. In trying to convince the bank President (John Vernon) that the robbery wasn’t an inside job, he describes himself as a mere simple man who only wants a simple life. Boyle says he believes him, and you believe that he does, but the scene’s setting, filmed in one long take on a ranch with cattle sprawling behind them, nevertheless equates the bank manager with a patsy being put out to pasture. Young might well be a good man, but the he has been backed into this corner by the world, and his fate, perhaps the film’s worst, suggests that he knows he’s not cut out for it. That’s the difference between people like him and Charley Varrick, who keeps playing the game as it unfolds before him, a pragmatist who even sells out his last living accomplice, Harman (Andy Robinson), though only after Harman has made clear his desire not to sit on the money but spend the rest of his life spending. It’s a predictable monologue, but one Robinson gives a convincing unhinged edge, someone who seems to recognize his fate even as he’s unleashing his words, as if just getting to have this much money for a minute is reward enough. Harman’s comeuppance is delivered by Molly. Though being tasked with recovering money from a persnickety foe might suggest Molly as a precursor to “No Country For Old Men’s” Anton Chigurh, the former never ever comes across all that existential. No, he is employed by the mob and openly depends on them for funding and tips, even transportation, though must repossess the car himself to drive it. The ancient adage of the pursed and the pursuant – We’re not so different, you and I – does not apply here. Molly and Charley are at opposite ends of the spectrum; the business professional and the last of the independents. And in Charley’s efforts to get away, he is simultaneously attempting to evade being ground up in The Combine, though the conclusion suggests those dueling notions might well go hand-in-hand.